3-year-old Ben Pratt received an early Christmas present last year when the nurse who had cared for him since he was born gave him one of her kidneys. 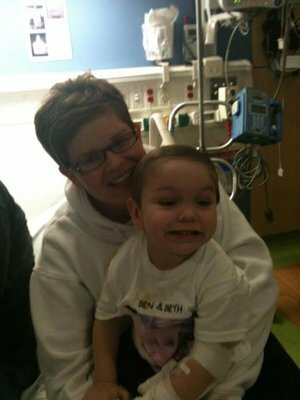 Beth Warren was Ben’s primary nurse while he was at Kentucky Children’s Hospital in Lexington, and she grew close to Ben and the rest of the Pratt family. Ben is doing fine since the surgery. He feels better than ever, and will be able to live a much more normal life thanks to this loving sacrifice. We Christians will be eternally grateful for the sacrifice that Jesus made for us on the cross, when he gave his life to save us. We know that this was God’s plan for us. “This is how we know what love is: Jesus Christ laid down his life for us. And we ought to lay down our lives for our brothers.”—1 John 3:16. Maybe you will never have the opportunity to donate a kidney, but we all have many chances in life to show sacrificial love to those who need it. As followers of Christ, this is what we are called to do. This entry was posted in Christian Living, Communion Meditations and tagged 1 John 3:16, Ben Pratt, Beth Warren, illustration, Jesus Christ, loving sacrifice, nurse donates kidney, salvation. Bookmark the permalink.